The welcoming community of Freeport, a hidden jewel on U.S. Route 20 in northwest Illinois, is bursting with new energy as it redefines itself with a contemporary vision for growth, a fresh brand, and the restructuring and reorganization of city government. Caring people, collaboration, creativity and an entrepreneurial mindset are the underpinnings of a new journey for this municipality of 25,612 people. Featuring acclaimed schools, including Highland Community College, this innovative community offers quality health care, arts and culture, and a skilled workforce. Visitors discover unique shopping, a local brewery and nearby wineries, hotels, restaurants, churches, sports facilities and programs, and a dog park. In addition, walking trails, bike paths, and first-rate parks and outdoor attractions make Freeport a special place to live or visit. The city is also home to Fortune 500 companies, including Honeywell, MetLife, Titan Tires and Newell Window Furnishings. Freeport is a storied town steeped in history. Lincoln Douglas Debate Square invites tourists to experience the spot where one of the most crucial Abraham Lincoln and Stephen Douglas debates took place in August 1858. Proclamations regarding states’ rights and slavery at this debate essentially turned the tide of U.S. history, allowing Abraham Lincoln to later become president. 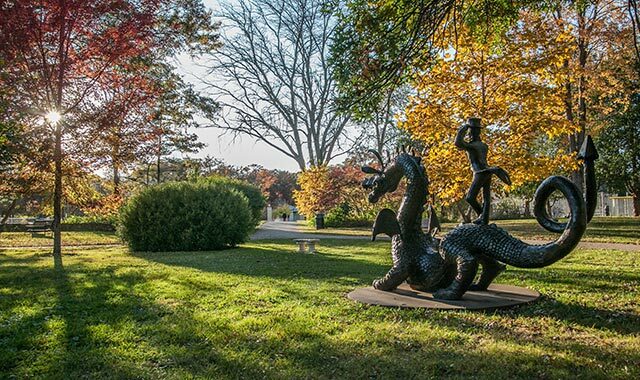 Two life-size sculptures of Lincoln and Douglas are the centerpiece of this pleasant, tree-shaded park. Step next door to a Freeport tradition at the famed century-old Union Dairy ice cream parlor, with its charming red counters, swivel stools, grill menu and 51 flavors of ice cream. Locals and visitors delight in the old-fashioned ambience. Union Dairy also sponsors First Friday Flicks outdoor movies at Debate Square. Few towns the size of Freeport can boast an art museum with the collections that Freeport Art Museum offers. The late Freeport industrialist W.T. Rawleigh amassed incredible European, Asian, and Native American treasures from his travels. These and many other works, including one of the largest tribal holdings in Illinois, are part of the museum’s collections. Local works of art are also exhibited, and the museum partners with schools and organizations to offer unique workshops and programs. Theater buffs are delighted with performances at Winneshiek Theatre, one of the oldest continuous all-volunteer amateur theaters in the nation. Local high schools, as well as The Ferguson Fine Arts Theatre at Highland College, offer entertaining productions throughout the year. The city has its own Field of Dreams in Little Cubs Field, a nostalgic tribute to Wrigley Field, with 46 authentic features including a replica scoreboard, brick walls and ivy. The Chicago Cubs gave their blessing to this project and donated dirt from Wrigley Field. Third baseman Ron Santo was the guest of honor for the June 2008 grand opening. Visitors can swing a bat or even book events at Little Cubs Field – a must-stop with plenty of photo ops for Cubs fans. A genuine one-room schoolhouse and an authentic Irish homestead log cabin are among the attractions at the Stephenson County Historical Museum and Arboretum. Featuring the largest collection of Freeport-made Arcade Cast Iron toys in the United States, the museum also gives nod to Freeport industries and important items manufactured in the city. On select weekends from May through October, The Silver Creek and Stephenson Railroad invites visitors to experience the chugging engine and open cars of a 1912 locomotive steam train on a 3.4-mile excursion into history. In addition, the Silver Creek Museum across the road offers 28 rooms of historical collections. All Veterans Memorial Park, a short distance from the railroad, invites contemplative reflection at its granite monuments and stained glass Gold Star memorial. After a day of sightseeing, enjoy Italian food at Cannova’s Italian Cuisine, Cimino’s Little Italy, or Rosati’s. Fiesta Cancun and Amigos offer Mexican delights, Imperial Palace features Chinese food, and Ichiban Japanese Grill and Sushi showcases unique samplings. Dining options abound at these and other family eateries and restaurants. Freeport’s scenic Krape Park features 120 acres bisected by meandering Yellow Creek, where fishing below the dam is a popular pastime. Cliffs, towering trees, wildflowers and picturesque footbridges invite walks on winding paved paths. A cascading waterfall has been the backdrop for gorgeous wedding photos, and music from the old-fashioned carousel beckons families to ride the enchanted ponies. Little ones delight in the duck pond, adventure golf and Kids’ Castle. A crowd cheers at the ball diamond as the aroma of grilled food from picnickers wafts through the park. Some opt for the tennis court, while others glide along the water in colorful duck paddleboats or canoes. On Sunday evenings, the Koenig outdoor band shell hosts community concerts for packed crowds. Named an outstanding multi-use facility by the Illinois Parks and Recreation Association, the park also offers cross-country ski trails and sledding hills. Oakdale Nature Preserve trails invite hikers and birders, and The Jane Addams Trail and Pecatonica Prairie Trail are a hiker’s and cylcist’s dream. In addition, there are some 300 miles of marked snowmobile trails in northwest Illinois, including the Jane Addams Trail between Freeport and Wisconsin. In the summer, try kayaking and canoeing along 58 miles of natural beauty on the Pecatonica River. Park Hills Golf Course offers gently rolling terrain and manicured greens on two award-winning 18-hole, par-72 courses, and The Freeport Club has one of northern Illinois’ finest courses plus a full-service bar, restaurant and banquet facility. Also, many annual events including Pretzel City Brewfest, Tour de Freeport, Art in the Park and the Stephenson County Fair bring people together to celebrate the unique flavor of Freeport. With free parking and easy walkability, downtown Freeport is an ideal destination for a shopping getaway. Check out trendy clothing and gifts at the Clothes Bin and Generations Boutique. Knitters enjoy the Wall of Yarn shop, and visiting Abett Books and Games is a must. From funky, eclectic offerings at the mother-daughter Rock and Rust Boutique to Royal Oaks Antiques and Collectibles, there are plenty of shops for treasure hunting. These businesses, owned by families or individuals, are an expression of the thriving entrepreneurial spirit in the community. Top off the day with a bag of scrumptious flavored popcorn from Dragon Popcorn. Also, a sampling of locally made Mrs. Mike’s Potato Chips is a must before leaving town. A Saturday morning in summer will also land you with fresh produce and time to chat with neighbors at the farmers market. A passion for the arts appears throughout Freeport, and the city will soon break ground for a downtown civic arts plaza. Funded by a highly competitive Our Town grant from the National Endowment of the Arts and a gift from an anonymous donor, the plaza with its gateway pergola, stage, screens, sculptures, walkways and a splash pad will support the city’s strategic plan to make Freeport a destination city. Danielle Rogers, former executive director of Freeport Downtown Development Foundation (FDDF), has most recently served as interim director for the Stephenson County Convention and Visitors Bureau. In 2016, FDDF voted to join National Main Street Center, which focuses on promotions, design, economic vitality and organization. Rogers says this group has been effective at rehabilitating historical buildings and bringing economic revitalization to towns across the state. Freeport is working toward accreditation with the Main Street Center, which will open doors for new grant opportunities downtown. A facelift in the downtown district is a priority as the city moves forward. In March, the city council approved facade grants for five downtown businesses. In addition, a $1 million bond, approved by the city council, will be used for downtown redevelopment. A partnership between the city and local banks, which will contribute $2.5 million, involves a self-sustaining revolving loan fund for economic growth and features an upgrade and expansion microloan program for existing businesses. Select historical buildings downtown are already brimming with new life. After sitting empty for years, Freeport’s century-old Carnegie Library is once more humming with activity. It was refurbished in 2017, with an eye toward retaining its historical design and integrity. With the phrase “In God We Trust” recently added above the front door, the dignified structure now houses City Hall. Bill Green’s vision turned a three-story, 1903 industrial building (that had housed Wagner Printing) into a thriving event space called The Wagner House. Rustic with exposed brick and ductwork, yet sophisticated with an urban flair, it provides a distinct ambiance for vibrant social functions. Corporate events, product launches, networking, fashion shows, fundraisers, pop-up art shows and weddings have become the culture at this popular gathering spot. Green is all about imagining new ideas, collaborating with others, promoting local arts and musical talent, and encouraging entrepreneurship in the region. Another renovated industrial building, part of the old Rawleigh complex, has become home to The Grand River Hall, a new 4,500-square-foot event space. Sisters Holly Boeger and Shelly Edler, with their sister-in-law Nikki Alber, took advantage of the Rockford Clock Tower auction to purchase banquet chairs and kitchen equipment for their venture. Hoping to complete the second and third phases of renovations by 2020, the women will add a multimedia room plus a ballroom capable of accommodating 500 guests. A classic freight elevator with an attendant is one of the unique features of the venue. In addition to weddings and other events, the venue hosts First Friday socials, often featuring live music. “There is a lot of entertainment coming in,” says Boeger, “and we eventually would love to offer a full-service venue that will draw weddings and events from Chicago, but with Freeport prices.” She also commends the collaboration of downtown businesses in supporting each other. Last year, Emarc Malavolti won the second annual Freeport Fish Tank (a “Shark Tank” style competition for entrepreneurs) with his Fresh2Go oral hygiene product. Since then, he has also become the catalyst behind Mastermind, a program to inspire those with a dream. Aspiring entrepreneurs, successful businesspeople and speakers meet at 6 a.m. the first Saturday of each month; the early hour is designed to deter those who are not serious. Recently, Highland Community College President Tim Hood announced that the college will partner with Mastermind on meeting content, facilitating future meetings and procuring speakers. A June Mastermind conference at Grand River Hall featured a keynote address on vision and leadership by Rockford Mayor Thomas McNamara. Malavolti and his associates eventually envision bringing their program to the national forefront. Some additional businesses offering testaments to a locally focused economy include: The Cheese Market, Higher Grounds Coffee Shop, Gemorifics Jewelry, Country Girl Floral and Gifts, and Juliet’s Bridal and Formal. Like many communities that lost manufacturers to overseas competitors, Freeport needed to be reminded of its proud heritage and the bright future that could lie ahead. In 2016, members of Collaborate Freeport, a forward-thinking grassroots movement supported by passionate individuals, community development organizations, and business and government leaders, realized they needed data to understand how the community viewed itself. Answers to some 400 surveys indicated that too many residents felt Freeport was headed in the wrong direction. People needed to feel good about where they lived and where they were headed. Something needed to change. Collaborate Freeport worked with a5, a Chicago firm, to develop the Freeport ALL IN brand, an internal campaign to help people see themselves as part of the whole to work together for a brighter future. The second half of the campaign, ALL IN Freeport, is the external piece that promotes Freeport’s unique attractions to encourage tourism. Through social media, the web, events, creative projects, eye-catching signage and consistent “all in” newspaper testimonies, the group sought to generate a positive buzz. Data collected at the end of 2017 indicate that 72 percent of people now look at Freeport in a much more positive light. Marketing in 2018 continues to reach a broader audience, focusing on the city and county’s work ethic, entrepreneurial spirit, livability, downtown, history, outdoor experience, art and culture, volunteerism and diversity. The fact that Collaborate Freeport and the Freeport ALL IN campaign won awards for the best branding initiative and the best website in their division from the Illinois Governor’s Conference on Tourism is indicative that the positive impact is being noticed outside the local area. Amy Fairweather, who has worked extensively with Collaborate Freeport, grew up in the community but went away to college and lived in several urban cities. Freeport’s transformation includes the adoption of a council-manager form of government, a major change for the city. Lowell Crow assumed the new role of city manager in May 2017 and voters elected Jodi Miller to be the first female (and part-time) mayor since the town’s incorporation in 1855. Partnering closely with downtown organizations, the arts sector, community leaders, and business and economic development stakeholders, the city has developed a long-range 2030 strategic vision. Its priority areas include: a connected and accessible community for all; diverse and engaged citizens; premier education, arts and culture; a thriving, entrepreneurial economy built on our maker heritage; and a responsive, efficient government and public/private partnerships. Some of the more immediate tasks at hand include building two new wells and upgrading roads and infrastructure, demolishing blighted buildings, enforcing city cleanup and east-side flood mitigation, implementing an integrated fiber optic network to make Freeport a tech-smart city, streamlining policy to grow the economy, conducting a 2020 Census impact study, and completing new bike paths. Looking ahead, both Crow and Miller believe the single most significant development this year is the implementation of Greater Freeport Partnership, which brings the merger of Northwest Illinois Development Alliance (NIDA), Stephenson County Convention and Visitors Bureau, Freeport Downtown Development Foundation, and the Freeport Area Chamber of Commerce under one umbrella. Encompassing the spirit of regionalism and collaboration, with one vision and one mission, the charge of the new partnership is to promote economic development, business services and area tourism. Under the guidance of newly hired executive director Rebecca Motley, the organization started its venture in June. “Greater Freeport Partnership is the one-stop-shop for anyone interested in visiting Freeport or moving here,” Miller says. Another boon is a new access road for Albertus Airport, which, outside of Rockford, is the second-largest airport in northern Illinois. The city will contribute $100,000 as a match to a $1 million state grant for the road that will open a number of acres for hangars and business use. An aircraft engine repair business and a solar company have already indicated an interest in moving to the area, Crow says, adding that Freeport recently took steps toward seeking a solar-friendly designation to advocate for renewable resources in its energy program, and hopes to attract more solar energy companies to the area. An additional sign that Freeport is moving forward includes the groundbreaking of the first new home since 2008. The now-completed “smart home” is the first of 25 projected new homes expected to be built in a specially designated enterprise zone. Signaling more growth, several entrepreneurial businesses have opened their doors this year, including the new Physicians Immediate Care/FHN Urgent Care Clinic. In addition, the city has recently welcomed a number of chain stores. When MetLife left in 2014, it was a blow to the city, but the insurance firm’s return in 2017 brought 100 new jobs, and the anticipated need for another 100 employees is cause to celebrate. With plenty of enticing reasons to take that exit on Route 20 to Freeport, the best is yet to come as the city undergoes a vibrant revitalization. The welcome mat is out for tourists and businesses to discover what awaits. This entry was posted on Friday, August 17th, 2018 at 11:58 am	and is filed under Features, Top Posts. You can follow any responses to this entry through the RSS 2.0 feed. Both comments and pings are currently closed.